Army themed T-Shirt, great for people who love Lets Go!, Fulda Gap, 11th Cavalry and 11th ACR. Personally designed by a veteran specifically for those Cold War Vets with cool stylish pattern printed on. This Army themed T-shirt is perfect for 11th Cav lovers. It is available in various sizes and colors. It would make a great gift for any birthday, Christmas, graduation or any gift giving occasion. 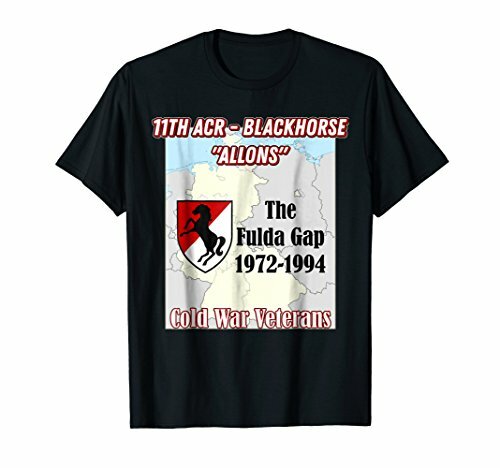 People who love Fulda Gap, 11th Cavalry, 11th ACR and Cold War Veterans are sure to love this tee shirt. These t-shirts have cool sayings, great graphics, and Allons theme. If you have any questions about this product by 11th Armored Cavalry Regiment Army Tees, contact us by completing and submitting the form below. If you are looking for a specif part number, please include it with your message.